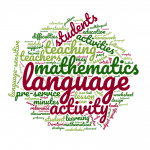 For students of all backgrounds (both mono-lingual and multilingual students) it is important to develop the subject-specific (academic) language of mathematics. This language is needed for conceptual understanding and ‘meaning-making’ in mathematics. The development of subject-specific language can be facilitated by adopting a language-sensitive approach to mathematics. The module will introduce teachers at ITE (initial teacher education) to the relevance of language in mathematics and provide them with background and tools to teach mathematics in a language-oriented (or language-sensitive) way. Although multilingual students will encounter other and maybe more problems than monolingual students, this approach is aimed to benefit all students in developing their mathematical proficiency.